Complimentary memberships – Receive WLA Individual membership for up to 8 Trustees or Associates, depending on the dues level of your organization. Reduced registration – Receive Member-rate registration for up to 3 additional employees for conferences and workshops, depending on the dues level of your organization. Exhibitor discounts – Receive discounted rate for conference Exhibitor Hall participation. 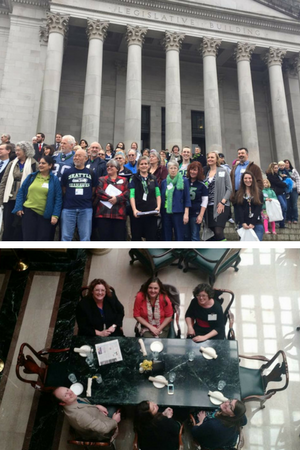 Legislative advocacy – Consult with and benefit from the support of WLA’s legislative lobbyists and representation on WLA’s Legislative Committee, and attend the annual Washington Library Legislative Day. Listing on WLA website and Alki – All Organizational members are recognized for their support on the WLA website and in Alki, WLA's quarterly journal. Continuing education – Find CE opportunities for your staff, trustees, Friends, and advocates via WLA’s conferences, workshops, and other events. WLA also conducts a biannual continuing needs assessment of libraries in partnership with the Washington State Library. Professional development – Find professional development and leadership skill-building opportunities for your staff, including serving on or chairing statewide committees, planning conferences, presenting programs, holding Board or other leadership positions, and more. Divisions and Sections – Access Divisions and interest-based Sections that provide focused listservs and events for the sharing of professional information and resources statewide and across different kinds of libraries. View a list of our current Organizational members here! Library Calculated using dues formula This membership type is for libraries. Dues for Organizational members are .03% of operation expenditures, exclusive of construction and one-time funds. The minimum dues amount is $100, and the maximum is $10,000. This formula is the same for all types of libraries. Friends of the Library $50 or $100 Friends of the Library organizational members may self-select their dues level — either $50 or $100. Foundation $50 or $100 Foundation organizational members may self-select their dues level — either $50 or $100. Nonprofit $50 or $100 Nonprofit organizational members may self-select their dues level — either $50 or $100. Business & Sales $100 or $300 Business & Sales organizational members may self-select their dues level — either $100 or $300. Join as an Organizational Member! To join, fill out our Organizational Member Application and email it to [email protected]. This application is for any organizations, groups, or other entities joining WLA as one of the above member types. If you are interested in joining as an individual, check out our Individual memberships. All WLA Organizational members receive complimentary WLA Individual membership for up to 8 Trustees or Associates, depending on the dues level of the organization. They also receive Member-rate registration for up to 3 additional employees for conferences and workshops.